What the hell have I been doing with my life? Making nice things for you to look at. "Would you hit a man with glasses?" 46"x32" reduction woodcut on canvas, edition of 7. For my advanced printmaking class we had to do a collaborative project, where every student made an edition of postcards. The only limitation was that it was a print on a 4"x6" sheet of paper. This is mine, 2 color screenprint on stonehenge paper, in an edition of 28. "Biking to the Bluffs" 18"x10" reduction woodcut and silkscreen on stonehenge paper. Edition of 8. I made an edition of counterfeit David Copperfield autographed photos with Burger King crowns. "King for a Day" 10.5"x8.5" digital and silkscreen on stonehenge paper. Edition of 24. "I'm not a monster" 23"x30" 3 color screenprint on stonehenge paper. Edition of 5. I've got a few friends here in the photo department at Purchase, and for their junior show they asked me to paint a holiday scene on the walls. Along with my collaborators Ephraim,Manuel, and Alex, we came up with our rendition of a holiday scene. The show should be up until the end of January, so check it out in the basement of the visual arts building. I've been working on a massive painting/collage/installation based on events that happened on a friday night in the city.Its going to be over 30 pieces, and will probably reach about 20ft tall and 30 ft wide. This is what I've got so far^. Its 4 in the morning right now, and I've got an artist statement due today at 8. Its really difficult for me to write about my work and summarize it in a few paragraphs. I'm still figuring out what it is that interests me as an artist, I'm definitely getting closer, but I'm not there yet. In need of some inspiration I checked out this video of one of my heros Barry McGee. If I had to name one artist that has a major impact on my work it would be him. Pure genius. Check it out, you'll understand what I'm saying. These songs are so good, I can't stop listening to them. If you didn't know Julian Casablancas is/was? the lead singer for the strokes and these tunes are from his solo album Phrazes For the Young. "Something beautiful has died" Gouache on 2ft by 4ft piece of cardboard. A few weeks ago my painting class had a guest artist critique with an artist by the name of Clay Ketter. I showed him my last dead bird painting and he really liked the idea of taking something sad and gross and making it beautiful, so I'm going to keep trying to push this idea a little farther. Here at purchase some students organized a little thing called art on the fence. Theres all these fences across campus covering up the construction, and my friend Mitch came up with the idea of putting up art on them. This is my work. Its called "Self-Portrait as a Tiger, Playing Badminton in 1963" acrylic on 2ft by 4ft acrylic on wood. He's the next Tony Hawk. Some Highlights from my collaborative installation with EPHRAIM HAFFTKA, Alex Derwick, and Manuel Bova. Heres a video my brother took of me and the boys playing "the national anthem of Wyldlife" at a house party somewhere in Pennsylvania. House parties are without a doubt the best shows to play. "It's Still Real To Me" Time Lapse from elliot lobell on Vimeo. My friend Elliot made a really cool time lapse of us putting the wrestling ring together for our art show. I've been working so hard on a collaborative installation with my boys Alex Derwick, Manuel Bova, and Ephraim Haftka. 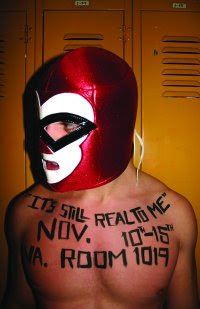 Its titled "Its Still Real To Me" and its up in the Suny Purchase Visual Arts Building room 1019 from November 10-15 opening reception tomorrow November 12th at 6:00. Come check it out! I'll be putting up more photos soon! "Yeah but what are you going to do about it? "4ft by 2ft. Gouache and phonebook paper on cardboard. I'm quite proud of this piece. I was reading this article in Rollingstone about how they've been finding these seabirds that just eat strictly garbage, its so messed up. "Waiting for the 1 train" 55in by 36in. Spraypaint on cardboard. I''m happy with the figures, but I don't know how I feel about the whole composition. "Families Rule" 27in by 21.5 gouache on cardboard. The boys and I have been hard at work on our next show, it will blow your mind, I kid you not. This may be one of the coolest exhibitions Purchase has ever seen. I'll post more info soon. 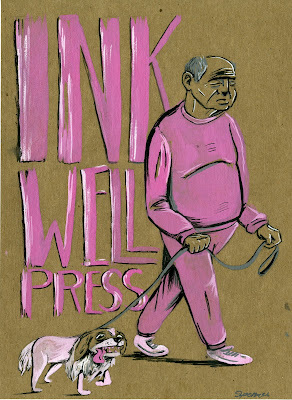 A week ago I was asked to do a cover for a magazine from CT called Inkwell Press, and this is it. Gouache on cardboard. I've got some more paintings I've been working on, I'll post some photos soon! Just found this gem on youtube. You can't fall in love with potential. So the Social D concert was quite an experience. The bus ride was pretty damn long, but I slept most of the way, so it wasn't a big deal. Atlantic City was a trip for sure. We were dropped off at the Show Boat casino, which if I recall correctly, you can win a trip there if you are the winner of a show case on the Price is Right. I had never been to a casino before, so it was quite an eye opening experience. I'm only 20 so I couldn't gamble, but I'm sure that is for the better. There seemed to be a lot more losers than winners, people who looked really down and out, passing out on random couches and chairs. It was pretty depressing. The show itself was crazy. What I learned is that Social D's demographic is basically really tough looking middle aged white dudes. During the show about 5 fights broke out right next to me. It was ridiculous. Everyone seemed to be on edge, but this didn't prevent me from having a good time. Even after 30 years those guys can still rock, and they put on a great show. Mike Ness even gave me a shout out because I guessed the name to their song "Bakersfield" that was soooo damn cool. I can finally check seeing my favorite band off my list of things I've done. The ride back was intense, we arrived at the Port Authority bus station in New York city at about 3:30 am and were stuck there till 4:45am. If you want to see some sketchy people I recommend you go there at 4 in the morning. Lots of interesting folks. All in all it was a great adventure, just like I had thought it would be. "King for a Day" silkscreen on autographed photo. Over the summer I found this framed 8.5x11 autographed photo of David Copperfield at a thrift store. I silkscreened the burger king crown on his head. I've been really interested in working on top of paintings, photos, and random things I come across, and this is a little exploration in that direction. A while ago I made this squid poster for a show at my school. My friend Franco liked it so much he got it tattooed on his arm. Skin is a relatively new canvas to me haha, its an honor to have my art on someone's body. Thanks Franco. "Killer Wyldlife, the Champagne of Bands"(26"x8") a one color screenprint I threw together last evening, edition of 35. I've been doing alot of last minute posters every time Wyldlife has a show haha. I put them up at 2 in the morning and most were taken down by the afternoon. Its cool that people like them so much they want to steal them, oh well. If your looking for something to do tonight come check out me and the Wyldlife boys at the Stood, 10pm, its going to rock, and I promise you won't be disapointed. "The Death of a Passenger Pigeon" (22"x30")reduction woodcut, in an edition of 20, on Stonehenge paper. This was my first reduction print and I'm pretty happy with how it came out. You may be asking, what is a reduction print? Well, what you do is carve out the first color from the woodblock (the background color), print it on paper, and then carve out the second color and print it on top of the first color. I'm definitely going to make more of these in the future. This weekend has the potential to be one of the best of my life. Tonight I get to play a show on the main stage at Purchase, while tomorrow I'm taking a 5 hour greyhound bus ride, to see my all time favorite band Social Distortion at the house of blues in Atlantic City, New Jersey. Its going to be an adventure!